This is Jake, a six-year-old Golden Therapy Dog. Jake has been registered with Therapy Dogs International since his first birthday and is a Delta Society Pet Partner. And, this incredibly smart dude has also earned a combination of ten titles in the areas of obedience and agility. Of course, that was with Mom Danielle Wilson's help. Danielle is a Reading Recovery Teacher from Hurdle Mills, North Carolina. 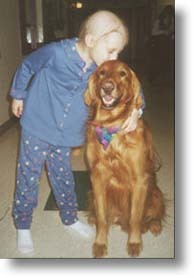 Jake is a member of Duke's Children's Hospital's Critical Care Unit's Pet Therapy Program. He was selected for the program during its inception and is the only remaining original member. Recently, Danielle and Jake had a very special visit take place at Duke. On this visit there were mostly infants (who cannot have pet visitors), some older kids who were not too interested in a meeting, or youngsters who were unable to visit due to being on respiratory isolation. But when they went on the chemotherapy ward, the magic started to happen. They met a very special fellow who truly touched Danielle's heart and soul. In fact, she believes no other child has ever moved her as deeply. Jake stayed and visited with this dude for over an hour and a half. This smiling youngster physically held onto Jake and cried and cried. He hugged him, fed him some treats, looked at his puppy album bragbook, and then hugged him and cried some more. He just couldn't let Jake go. Jake then planted some very gentle kisses on a sweet little head that displays the tough effects from chemotherapy. After showing off some tricks, this young man proceeded to squeeze his furry soulmate with every ounce of energy he could muster, relating, "I can see into his eyes." Danielle told him that Jake truly loved him in a very special way as he is extremely stingy with his kissesgiving them to NO ONE (hey that sounds just like our gal Darcy!). But for some reason he actually managed to get some. Feeling the scar where Jake had had his cancer surgery, he asked about what had happened. Hugging Jake again, he then assured him that things were surely going to be fine. And, while he kept from sharing in his own experience with cancer, one knew that he too was hoping that everything would turn out for himself as well. Although Danielle will be visiting on this unit again before Christmas, saying goodbye that night was harder than she ever could imagine. How could she not be in tears in the elevator after seeing such teary eyes as he waved goodbye at the elevator. But, how lucky we are to have such Golden hearts working to mend those in need! On Saturday, October 6, Jake, a Golden Retriever that is this year's ACE Award honoree in the category of Therapy dog, received a silver collar medallion and $1,000 check to commemorate the occasion. The presentation was made at the New Castle Kennel Club in Aliquippa, Pennsylvania. 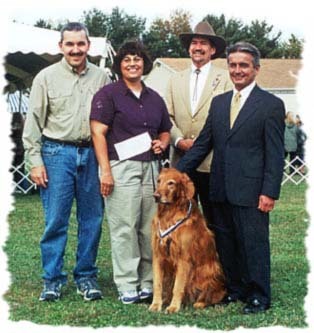 Participants in the ceremony, from left to right were: Douglas and Danielle Wilson (owners), Lee Herr (President of New Castle Kennel Club), Ronald N. Rella (AKC Asst. Executive Secretary). 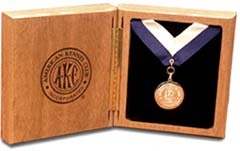 The ACE Awards are presented in five categories - Exemplary Companion, Law Enforcement, Search and Rescue, Service, and Therapy, winners receiving this engraved silver collar medallion as well as a $1,000 cash award. I am proud to announce that a very Golden special friend to the Land of PureGold won this prestigious award in the Therapy category. And, he was the ONLY Golden Retriever to be an ACE winner. Whoaaa!! Congratulations to Therapy Dog Jake and his wonderful human companion, Danielle Wilson. Here is Jake's story as told by the AKC. Once in a lifetime, if you're lucky, a dog like Tobys Sunny Jacob Don Wilson CD, NA, NAJ, TDIA (Jake) comes along: smart, versatile, and instantly beloved by all he meets. For Danielle Wilson, Jake is that dog. When not working toward obedience and agility titles, Jake is a therapy dog at the Duke University Children's Hospital Critical Care Unit. He is a Delta Society Pet Partner and is also certified by Therapy Dog International, which has bestowed upon Jake its "Active" title (TDIA) for his more than 50 hospital visits since March 2000. In addition, the Golden Retriever Club of America recently honored Jake with its first-ever Gold Standard Award for "enriching and inspiring us for a lifetime." 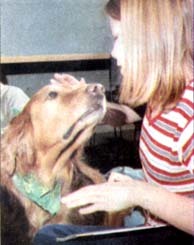 Wilson, an elementary school teacher, uses Jake as a classroom demonstrator when presenting her Prevent-a-Bite program to students. 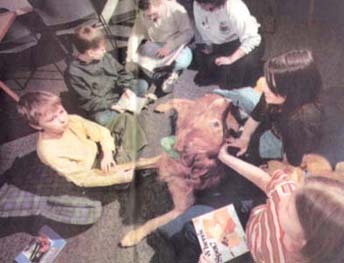 His involvement in Wilson's Golden School Read-Ins at the library has led a local newspaper to dub Jake "the Reading Dog." But Jake's true calling is therapy work. 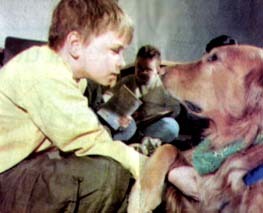 Countless suffering children have been comforted by Jake's irresistible charms. The parents of one 8-year-old boy told Wilson that their son's sole motivation for going to his chemotherapy treatments was to visit with Jake. During his treatments, the boy sat calmly with Jake by his side. And when the inevitable happened, Jake was in the bed cuddled beside the dying child. Young cancer patients have a special affinity with Jake, who waged his own successful fight against the disease in 1998 and continued to visit the hospital during his treatment. Wilson says, "He became a source of inspiration and a connection for those kids who had cancer." Students in Helena Accelerated Reader program surround Jake the the reading dog during a read-in session last week. The students pictured are Ethan Taylor, Josh Broughton, Matthew Williams, Teacher Danielle Wilson, Melissa Harris and Brittney Walker. HE SAT QUIETLY, his red head bowed toward a book, big brown eyes intent on every word being read to him, a paw resting softly on the knee of the child who was enthusiastically reading Gas Station Charlie. Jake, a six-year-old Golden Retriever, visited Helena Elementary School last Friday, wearing his "work harness" and ID badges. There he listened to third, fourth, and fifth graders read their Accelerated Reader books to him. 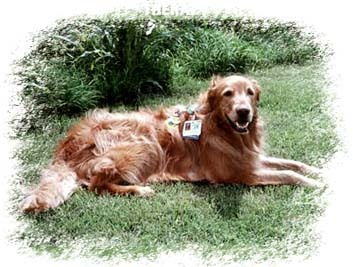 Badges identify Jake as a certified therapy dog who also works at Duke Univ. Medical Center. As Jake stood at attention, waiting for his owner to give him directions, a group of five children entered a small room off the media center, petted the large dog, uttered delighted cries and giggles, then settled down with pillows and stuffed animals to share their favorite books with the "reading dog," that belongs to Helena reading recovery teacher Danielle Wilson. Wilson, who received Jake as a wedding gift from her husband six years ago, told her excited students, "He doesn't care if you read fast or slow, he likes to listen." And indeed, the dog did seem to enjoy the half-hour read-ins and the attention of the fascinated young humans. Moving from child to child, sometimes offering a paw, sometimes licking the ear of a wiggling reader, sometimes staring intently at a reading child, Jake made his rounds and delighted the students. His owner said he had been trained as a therapy dog when he was very year. After a one-year, initial training period, Jake attended special classes and was certified as a therapy animal, making him eligible to visit hospitals, nursing homes and schools. He now sits with children at Duke University Medical Center and helps calm their fears as they undergo chemotherapy. He visits the pediatric critical care unit at Duke on a regular basis where he "crawls with the kids, gives them kisses and sits with them," to help ease the fright of hospital stays, Wilson explained. He also visits the Ronald McDonald House in Durham, to give patients and families a light-hearted break from the seriousness of illness. Jake listens attentively to Brittney Walker & enjoys a pat on the head at the same time. When Wilson's students worked hard on meeting their AR goals this year, she said she decided to reward their efforts with a visit from Jake. She took him to the school last year, for a Prevent-a-Bite program that teaches children how to interact safely with dogs, and said the youngsters seemed to enjoy him then. She said many still remembered him from that visit and were excited about being able to read with him last week. After securing permission from parents, Wilson put the names of her 200 students in a hat and had "an impartial party" draw the names of about 20 lucky readers who then shared their favorite books with the dog. Wilson said the impending visit with Jake had served as "real motivation for the kids." "I thought it would be a nice reward for them for meeting their reading goals," she said. When he was a young puppy, Wilson said she took Jake to obedience classes and was told he had the perfect temperament to be a therapy dog. After obedience, he then trained as a therapy animal and is now certified by two national organizations, Therapy Dogs International and Delta Society. students read to Jake, who belongs to Danielle Wilson, Helena's reading recovery teacher. According to Delta Society, for an animal to be certified as a therapy dog it must meet certain criteria, complete training and show that it has the temperament and obedience needed to interact with people. 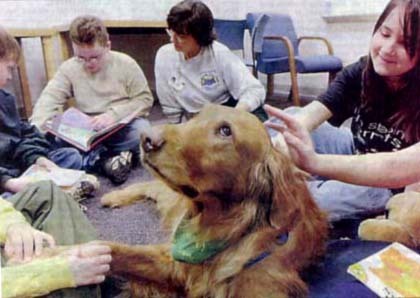 Therapy dogs are different from what most people know as "seeing eye dogs" or service animals that work with disabled individuals. Service animals are legally defined by the Americans With Disabilities Act of 1990 and are trained to meet the disability-related needs of their handlers who have disabilities. Federal laws protect the rights of individuals with disabilities to be accompanied by their service animals in public places. To be protected by federal law, the person must meet the definition of having a disability. To have the right of access with the animal to otherwise "no pets/animals" areas open to the public, the person must meet the definition of having a disability and the animal must meet the definition of service animal. Service animals and service dogs are not considered "pets." Therapy animals are not legally defined by federal law, but some states have laws defining therapy animals. They provide people with contact to animals, but are not limited to working with people who have disabilities. They are usually the personal pets of their handlers, and work with their handlers to provide services to others. Federal laws have no provisions for people to be accompanied by therapy animals in places of public accommodation that have "no pets" pollicies. Also, according to Delta Society, human-animal interactions may provide many benefits to adults and children in a variety of human care facilities. The organization says studies report that children who live in homes in which a pet is considered a member of the family are more empathetic than children in homes without pets. Individuals who have mental illness or low self-esteem focus on themselves and animals can help them focus outside of themselves, according to Delta Society. Rather than thinking and talking about themselves and their problems, these individuals can focus on the animal instead, many times feeling more positive. In situations that are depressing or institutional, the presence of the animals serves to brighten the atmosphere, increasing amusement, laughter and play. These positive distractions may help to decrease people's feelings of isolation or alienation. The Delta Society says that, in hospitals, where most touch is painful or invasive, the touch of an animal is safe, non-threatening, and pleasant. There are a number of programs for people who have been physically or sexually abused in which staff and volunteers are not allowed to touch the clients. In cases like these, having an animal to hold, hug, and touch can make a world of difference to people who would otherwise have no positive, appropriate physical contact. Wilson said Jake took to his duties as a therapy dog like a champ and that now, as soon as he puts on his harness, he "goes into work mode. He is like a seeing-eye dog," she said, "when he's wearing the harness, he's working." And, he worked hard last Friday to entertain Wilson's students. After hearing the kids read, Jake then displayed a few of his best tricks for them. As the children took turns holding a box of tissues, Wilson would pretend to sneeze. Each time she did so, Jake raced to the child holding the tissues, grabbed one in his mouth and took it to his owner. With five kids watching in wide-eyed wonder, he stood perfectly still, not blinking an eye, a treat balanced on the end of his nose, until Wilson gave him the OK to eat the treat. One quick toss of his big head, red hair whipping around his neck, and the treat was firmly in Jake's jaws as children squealed with pleasure. It appeared that the students agreed with Jake's proud owner when she said, "He's a good boy. He's very special." 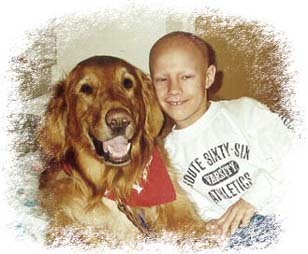 To learn more about animal assisted activities and therapy dogs like Jake, visit www.deltasociety.org or www.tdi-dog.org. "Jake" the Golden Retriever gets a lot of love from Helena Elementary School students including (clockwise from left) Josh Broughton, Matthew Williams, Reading Recovery teacher Danielle Wilson and Melissa Harris. These students were part of the motivational read-in that took place Friday at the school. Students who reached their reading goals became eligible to spend part of their school day reading to Jake, who belongs to Wilson. "Lessons in Love" by Danielle Wilson, Reading Recovery Teacher, Therapy Dogs International, Delta Society, Association of Pet Dog Trainers (APDT) and Durham Kennel Club affiliations. Winner of Folkmanis Golden puppet from Rochelle Lesser, honoring our Mistfield Oliver CGC "Ollie"; Clayvision Charms; Book: Gas Station Charlie: A True Story about a Real Dog; Astro Doggie Dog Toy; and, Karen Goldberg's CD, "Treading Water"